After spending hours hand knitting a pair of warm fuzzy mittens, you’ll want to be sure your final stitches are perfect. Closing the gaps left in your knitting will be essential to making those mittens both beautiful and warm. These mitten bind off tips will help you finish your knitted gloves neatly. Finishing mittens can be daunting, but don’t despair. My finishing tips will help you with binding off mittens and weaving in the loose ends. You’ll learn how to sew yarn tails into your work with duplicate stitch to close the holes at the base of the thumb. I’ll also show you my favorite way to round out the and finish off the tips of mittens. Step 1: Remove mitten thumb stitches from knitting needles. Put the loose end onto a darning needle and thread the loose end through each remaining stitch on your needles, taking the stitches off the needles as you go. Step 2: Pull the loose yarn to the inside of the thumb. With the darning needle, pull the yarn tail to the inside of the thumb. Step 3: Pull tightly to close the hole at the tip of the mitten thumb. Pull the tail tightly, and the hole at the tip of the thumb will close up. Anchor the yarn tail to the inside of the mitten using your desired method to weave in the yarn tail. I prefer to use a square knot to tie in my loose ends very securely. Others weave in the tail diagonally or in the pattern of the knit for a few inches to prevent it from coming loose after binding off mittens. When binding off mittens, finishing the fingertips on the main body of the mitten begins in the same way as closing the thumb holes. You’ll remove the stitches from the knitting needles. Next, you will make a decorative duplicate stitch, to both disguise the hole at the top of the mitten and to round out the hand of the glove so it is not pointy or square. Step 1: Remove mitten finger stitches from knitting needles. As you did with your mitten thumb, use a darning needle to thread the yarn tail through each remaining stitch on your needles, pulling it off the knitting needles as you go. Step 2: Pull tight to close hole at top of mittens. Straighten the stitches, and pull the yarn tail tightly. 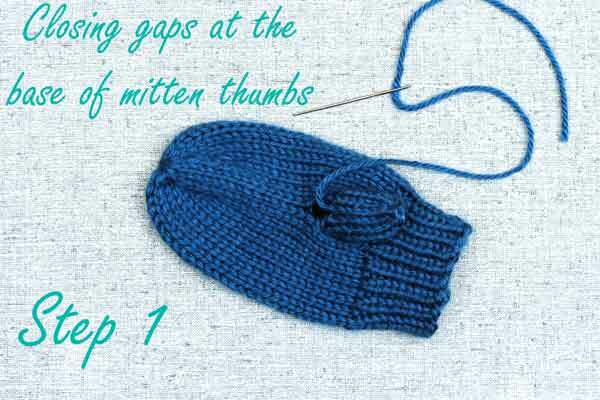 this will close the gap at the top of the mittens, leaving only a small hole at the top. Step 3: Begin the decorative duplicate stitch. Clicking on the image to zoom in is helpful at this point. Find the stitch directly across from where your yarn tail leaves the last stitch. In the same manner as you would make a duplicate stitch, bring the needle under both legs of the stitch. Step 4: Finish duplicate stitch and bring yarn to inside of mittens. Complete the decorative duplicate stitch by bringing the darning needle down through the middle of the stitch directly across the hole. round out a bit. With the remaining yarn tail, sew together the hole from the inside of the mitten, just to ensure it does not come loose over time. Weave in or knot in the yarn tail to secure it in place. In many mitten knitting patterns, like my basic knit mittens pattern, you will have an open gap at the base of the thumb when you have finished knitting. Closing this gap is simple if you understand the duplicate stitch. 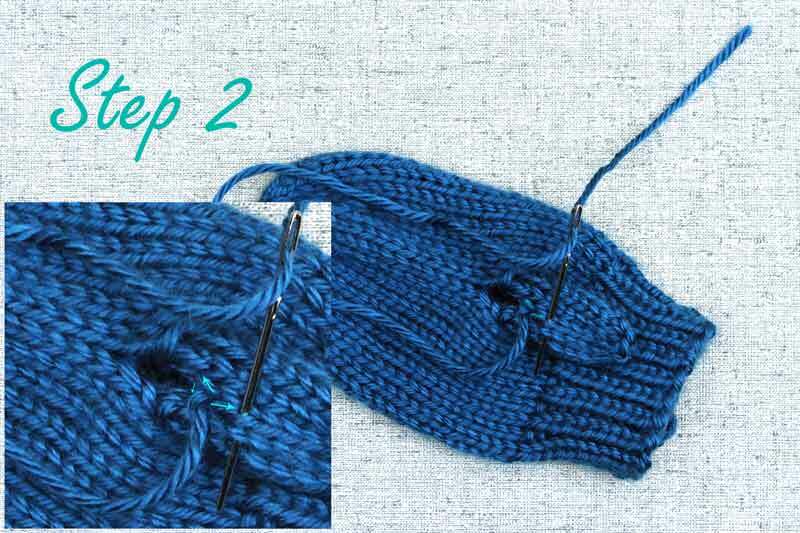 Below I will show you how I close the thumb gap on mittens using the yarn tail to duplicate the stitch pattern. Put the yarn tail that remains on the gap at the base of the thumb onto a darning needle. Following the pattern of the stitches on the glove, make a “U” shaped stitch on the thumb side of the thumb gap where the yarn tail comes out of the mitten. This will duplicate the stitch pattern and you’ll have a new knit stitch that closes part of the gap. Continue to follow along the stitches, and bring your yarn tail under and up the stitching to bring the yarn to the palm side of the mitten. Run yarn tail up, underneath and through the center of the stitch directly above the gap. 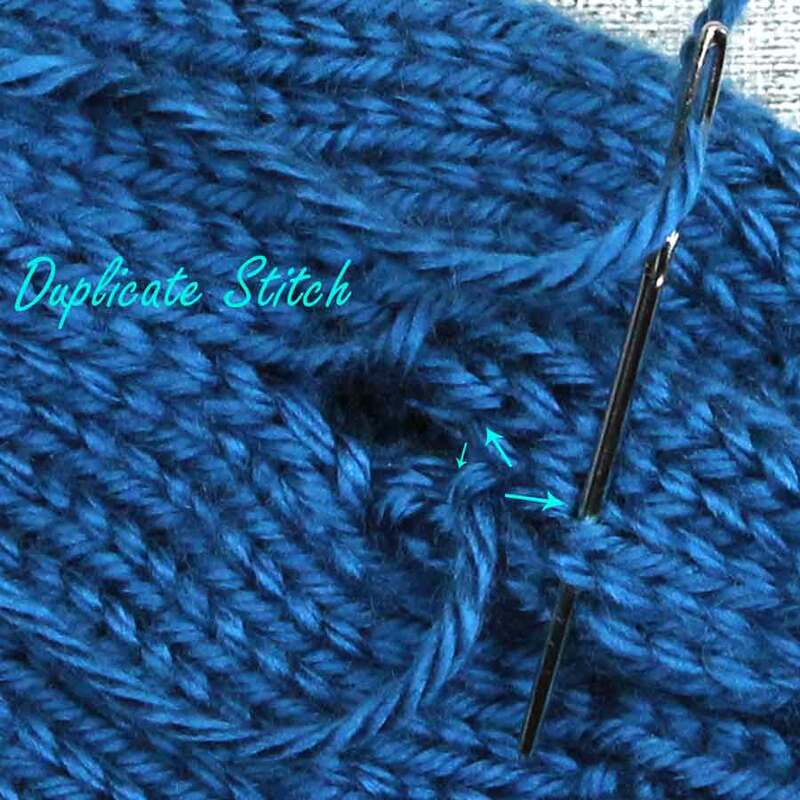 This will prepare you to make a second duplicate stitch. To make the first leg of your second duplicate stitch, you’ll need to run the tapestry needle under the stitches on the thumb side of the gap. This will allow you to both make one half of the “U” that will duplicate a knit stitch, and to close the gap of the mitten once the tail is pulled tightly. Bring the yarn back toward the center stitch on the palm side of the thumb gap by running the yarn under two stitches on the way. Make sure you do this so the gap will close when you pull the yarn tail. Bring the yarn back through the center stitch on the palm side of the thumb gap. Follow the stitch next to the duplicate stitch you just created to secure the yarn tail into place. Making sure to follow the pattern of the stitches, bring the yarn to the inside of the mitten to prepare to finish your glove. Pull the yarn tail tightly enough to close the gap, but not so tight that you distort your stitching. Weave in your end with your desired method to anchor loose ends. All done! I hope you have finished some beautiful work by binding off mittens with my tips.